Our FanCar post has elicited some considerable interest and curiosity in the possibility of crowdfunding sponsorship around NASCAR. Some have said it is a great idea, while others have shown skepticism. We figured we'd check the pulse to see what you guys thought about this model. Will it work? Check yes or no, and feel free to drop a "why/why not" in comments below. As an avid NASCAR fan, Matt Ferguson grew tired of seeing talented drivers - even former series champions - running Sprint Cup races without sponsorship in 2009. Ferguson was also frustrated by the now common practice of "start and park" entries and the number of cars without any sponsorship decals at all at any given race. One NASCAR fan's frustration with "start and park" entries has led to a new website that hopes to make a group of fans a sponsorship decision-maker. Ferguson started FanCar.com, a company designed to put the power of sponsorship in the hands of race fans. 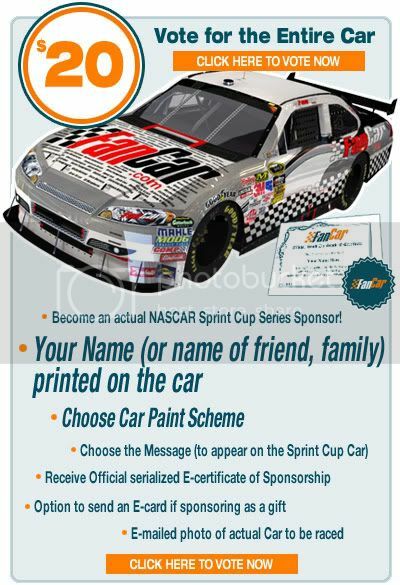 The FanCar concept allows a fan to visit www.fancar.com and become a NASCAR team sponsor for $20. In exchange for their investment, fans will be invited to vote on their favorite paint scheme, and choose the overall "message" for the car. Ferguson is currently in negotiations with several NASCAR Sprint Cup teams who have struggled with race-to-race sponsorship in the difficult 2009 economic climate to see if they are a fit for FanCar. "For all the years I've followed racing, I've heard drivers and owners say `It's because of the fans that we get to do what we love. Well, they're right - and FanCar is the literal realization of that idea," said Matt Ferguson, founder of FanCar. "We're looking for the right driver and team for FanCar to support at the Ford 400 at Homestead-Miami Speedway on November 22; a driver that fans will rally behind and pilot the first 100 percent fan-sponsored race car." In August, Kenny Wallace launched a similar program of his own, separate from FanCar, that asked fans to contribute $20 to sponsor his participation in Montreal's Nationwide race. More than 5,000 donated in exchange for their name on the car. Sell-A-Band.com offers a similar model for musicians and artists to get crowd-funded. Like any solid sponsorship deal, the sponsor has to receive quantifiable benefits, right? For becoming a NASCAR sponsor, FanCar participants will receive a certificate of sponsorship and a digital photo of the car. If the sponsorship is chosen as a gift, FanCar will send along an electronic gift card to the person selected. All funds raised by FanCar will go directly to the funding of the partnering Sprint Cup race team car - no development costs or transaction fees subtracted. "Just like any corporate sponsor, the fans will receive exclusive content and the inside scoop on what`s going on with the car before, during and after the race," continued Ferguson. "FanCar is a new paradigm in NASCAR team sponsorship. The fan is taking control." What do you think? Does this model have legs? Sell-A-Band lets "believers," in some cases, revenue share in the supported artist's revenues past a certain threshold. Could FanCar supporters eventually be financially rewarded for their favorite racer's weekend finish?